The Streamlight Strion was introduced several years ago as a compact flashlight that was very bright for its size and was rechargeable. Rated at 116 lumens and 12,000 peak beam candlepower, the Strion has a tail switch that allows for momentary on (when pressed) and constant on (when twisted clockwise). The Strion is significantly smaller than my department-issued Stinger, yet the Stinger is only marginally brighter. The Strion uses a 6 watt xenon bulb, and has a spare bulb in the tailcap. The Strion has a rechargeable battery that will run for about 70 minutes, and will recharge in about 2 1/2 hours. I have found that the 70 minute run time has been plenty for my uses. I have used the Strion on duty, and it performed well. The primary mission of my Strion, though, is as a off-duty and plain clothes flashlight. You see, I’m one of those freaks who believes that carrying a flashlight off-duty and in plainclothes is a good idea. The Strion is perfect in these roles for me. The Strion easily slips into the cargo pocket of a pair of shorts or BDU-style pants. Additionally, it also rides in the front pocket of a good pair of jeans. I rarely notice it when I am carrying it. Carrying it in a belt holder completely removes it from the wardrobe and makes it totally invisible and out of the way until you need it. The one thing you have to be aware of with all rechargeables is that the batteries have a limited lifespan. Generally, if you exceed a certain number of charges, they begin to lose the amount of energy (run time) they can store. Streamlight states the Strion’s battery is good for 300 charges. In my experience, they have surpassed that amount. My Strion has been “in service” for about 30 months and has been recharged at least 300 times. So far, the battery is still holding a full charge. I included some photos of the Strion, comparing it to the larger Stinger and the size of my hand. Please note that the current Strion’s have a slightly different texture to the barrel that enhances their use mounted on long guns. I have not tested my Strion mounted on a long gun, but I have no reason to believe that they would not perform well. The MSRP on the Strion with an A/C charger is $161.00. However, it can be had for much cheaper on Amazon. Editor’s note: This review was done a long time ago and is not as in-depth as our current reviews are. 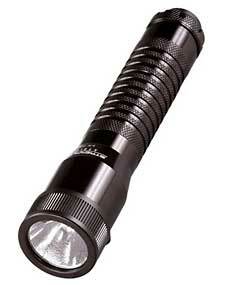 This flashlight is also an older model that is no longer made by Streamlight. It used a (dim by today’s standards) incandescent bulb while all of the modern versions use high output LED lights. I own several of the Strion LED lights and highly recommend them. You can read my review of the Strion LED HL here.